Global trade tensions, Italy’s fiscal battles and U.S. overheating pose risks to the euro-area economy, the European Commission warned as it lowered its forecast for the coming year. While the list of threats in the commission’s report aren’t a surprise, they come amid mounting signs of a persistent slowdown in the eurozone. The European Central Bank has said growth is merely stabilizing at a more sustainable pace, but there’s a question of whether there’s worse to come. The commission sees the 19-nation economy expanding 2.1% this year. For 2019, it sees growth slowing to 1.9%, down from 2% forecast in July. “Uncertainty and risks, both external and internal, are on the rise and start to take a toll on the pace of economic activity,” EU Commission Vice-President for the Euro Valdis Dombrovskis said. Some of the recent weakness is related to one-off factors such as a drop in German car production. The Bundesbank says Europe’s largest economy may have stagnated in the third quarter, but HSBC said Thursday it may actually have contracted. While growth will return this quarter, “the underlying trend is not anywhere near as strong as it was,” HSBC said. The euro area’s slowdown, if it persists, would feed into fears of a global economic cooling and complicate options for the ECB as policy makers prepare to cap asset purchases this year. The EU executive arm warned that there is a “high degree of uncertainty” and there are many interconnected downside risks. On inflation, the commission raised its 2018 forecast to 1.8% and left its 2019 prediction at 1.6%. The figures are broadly in line with those from the ECB. Among them is overheating in the US due to fiscal stimulus, which could mean faster Federal Reserve interest-rate increases, with spillovers to emerging markets. The EU could also suffer due to its strong trade links and banks’ exposure. 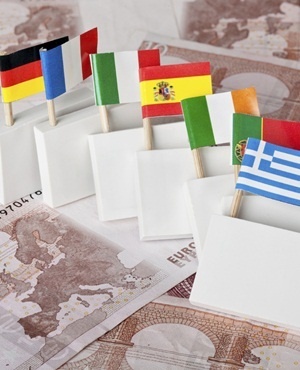 Closer to home, the commission said that doubts about the quality of public finances in highly-indebted countries like Italy could raise financial stability concerns. The EU sees the country’s deficit widening in the next two years and warned of intensifying downside risks. For Italy, the forecasts sees growth of just 1.2% next year, below the populist government’s 1.5% target. That has implications for the budget deficit, which the EU sees widening in the next two years, breaching the 3% limit in 2020. The projections come amid a standoff between Brussels and the government in Rome over the latter’s spending plans. The commission has rejected the budget, but Italy is showing little inclination to revise it.